If you are planning on building your own 3D printer or a CNC machine, you will need to control a bunch of stepper motors. And having one Arduino control all of them can take up a lot of the processing and not leave you a lot of room to do anything else; unless you use a self-contained dedicated stepper motor driver – A4988. 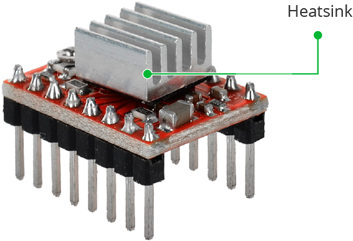 At the heart of the module is a Microstepping Driver from Allegro – A4988. It’s small in stature (only 0.8″ × 0.6″) but still packs a punch. The A4988 stepper motor driver has output drive capacity of up to 35 V and ±2A and lets you control one bipolar stepper motor at up to 2A output current per coil like NEMA 17. The driver offers 5 different step resolutions viz. full-step, half-step, quarter-step, eighth-step, and sixteenth-step. The A4988 actually requires two power supply connections. 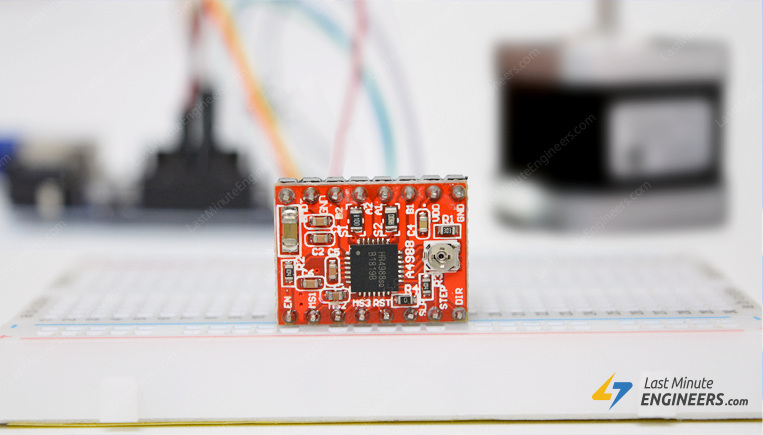 VDD & GND is used for driving the internal logic circuitry which can be 3V to 5.5 V.
VMOT & GND supplies power for the motor which can be 8V to 35 V.
This driver has low-ESR ceramic capacitors on board, which makes it vulnerable to voltage spikes. In some cases, these spikes can exceed the 35V(maximum voltage rating of A4988), potentially permanently damaging the board and even the motor. 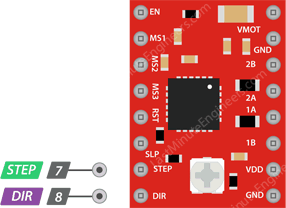 The A4988 driver allows microstepping by allowing intermediate step locations. This is achieved by energizing the coils with intermediate current levels. The A4988 driver has three step size(resolution) selector inputs viz. MS1, MS2 & MS3 . By setting appropriate logic levels to these pins we can set the motors to one of the five step resolutions. The A4988 has two control inputs viz. STEP and DIR. The STEP and DIR pins are not pulled to any particular voltage internally, so you should not leave them floating in your application. 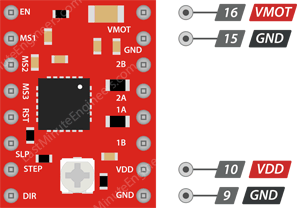 The A4988 has three different inputs for controlling its power states viz. EN, RST, and SLP. 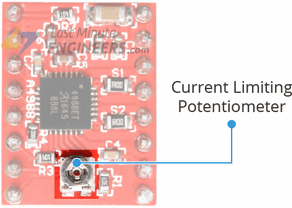 EN Pin is active low input, when pulled LOW(logic 0) the A4988 driver is enabled. By default this pin is pulled low so the driver is always enabled, unless you pull it HIGH. The RST pin is floating. 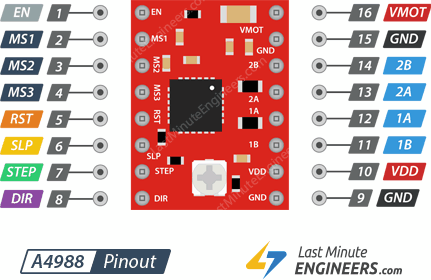 If you are not using the pin, you can connect it to the adjacent SLP/SLEEP pin to bring it high and enable the driver. The A4988 motor driver’s output channels are broken out to the edge of the module with 1B, 1A, 2A & 2B pins. You can connect any bipolar stepper motor having voltages between 8V to 35 V to these pins. Each output pin on the module can deliver up to 2A to the motor. However, the amount of current supplied to the motor depends on system’s power supply, cooling system & current limiting setting. Excessive power dissipation of the A4988 driver IC results in the rise of temperature that can go beyond the capacity of IC, probably damaging itself. Even if the A4988 driver IC has a maximum current rating of 2A per coil, the chip can only supply approximately 1A per coil without getting overheated. For achieving more than 1A per coil, a heat sink or other cooling method is required. The A4988 driver usually comes with a heatsink. It is advisable to install it before you use the driver. There’s a small trimmer potentiometer on the A4988 driver that can be used to set the current limit. In order to set the current limit, you need to follow below steps. Connections are fairly simple. 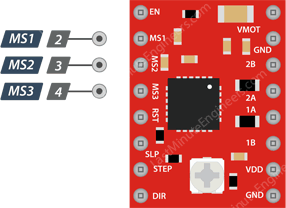 Start by connecting VDD and GND(next to VDD) to the 5V and ground pins on the Arduino. DIR and STEP input pins are connected to #2 & #3 digital output pins on Arduino respectively. 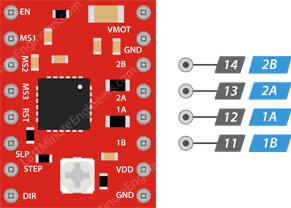 connect the stepper motor to the 2B, 2A, 1A & 1B pins. Actually A4988 is conveniently laid out to match the 4-pin connector on several bipolar motors so, that shouldn’t be a problem. Next, Connect RST pin to the adjacent SLP/SLEEP pin to keep the driver enabled. Also keep the microstep selection pins disconnected to operate the motor in full step mode. Finally, connect the motor power supply to the VMOT and GND pins. Remember to put a large 100µF decoupling electrolytic capacitor across motor power supply pins, close to the board. The following sketch will give you complete understanding on how to control speed and spinning direction of a bipolar stepper motor with A4988 stepper motor driver and can serve as the basis for more practical experiments and projects. 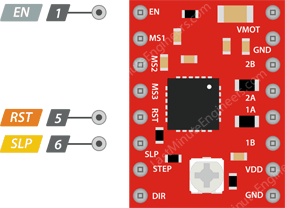 The sketch starts with defining Arduino pins to which A4988’s STEP & DIR pins are connected. We also define stepsPerRevolution. 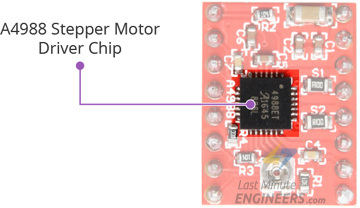 Set this to match your stepper motor specifications.